The state-of-the-art Manitowoc NEO series is the new kid on the (ice) block. Challenging the status quo in performance, intelligence, and convenience, NEO machines simply travel on a whole new level. Take the Manitowoc NEO U-140. This self-contained ice maker offers high productivity, matched by excellent storage space, thanks to improvements in performance (energy consumption down 10%, water consumption down 25%) that score wins for your bottom line and earn an Energy Star qualification. The unit is intelligent, thanks to its user-friendly options, enabling ice production delay (for up to 24hrs e.g. on closing days), auto-cleaning cycles, or a one-look status check (whether bin is full or service is required). It’s convenient thanks to a modular design that can quickly come apart (the bin is removable) for tool-free cleaning and maintenance; less cleaning is needed thanks to AlphaSan-fitted components and the valuable LuminIce Growth Inhibitor accessory. For an ideal undercounter fit, optional 30mm feet are available. Need more daily volume but got no extra space to spare? The Manitowoc NEO U-190 and Manitowoc NEO U-240 will trade you some in exchange for just a couple kgs of storage. A: Yes, this ice machine requires to be acid washed and sanitised regularly. 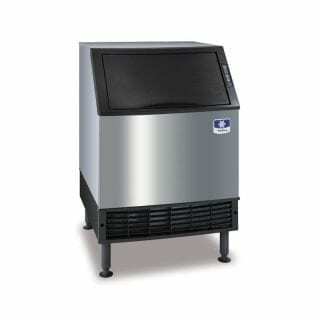 We recommend to cleaning condenser monthly and the ice machine itself at least every 3 months. Check our Cleaning Products page for our assortment of ice maker cleaners.